A very common swap for BMW E30s (which incidentally also used ABS-II) is the Teves MK60 as fitted to the E46 (2001+) M3. Actually, this unit is a common swap into many platforms, as it runs standalone and can be flashed with some fairly interesting software. Even stock, however, it's a much better, smarter unit. Most of the swap is prettymuch the same as for any other MK60 swap, but we encountered some 240-specific issues. Rear reluctors: the 240 ABS system uses a single reluctor & sensor in the differential. The MK60 needs individual rear wheel sensors. 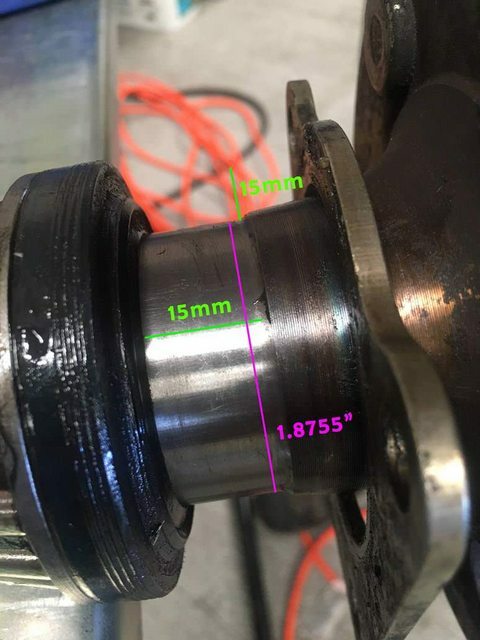 Happily, if you are prepared to ditch the parking brake, there's a nice machined surface on the axle in that area outboard of the axle seal. We sourced these from reluctorrings.com - if you call and ask they should have our measurements on file. Installation involves nothing more complex than a torch to heat the ring enough to expand it, and then it just drops into place (once you have removed the bearing, of course). If you want to make your own, the rear reluctors need to be made with 48 teeth (same as the front). 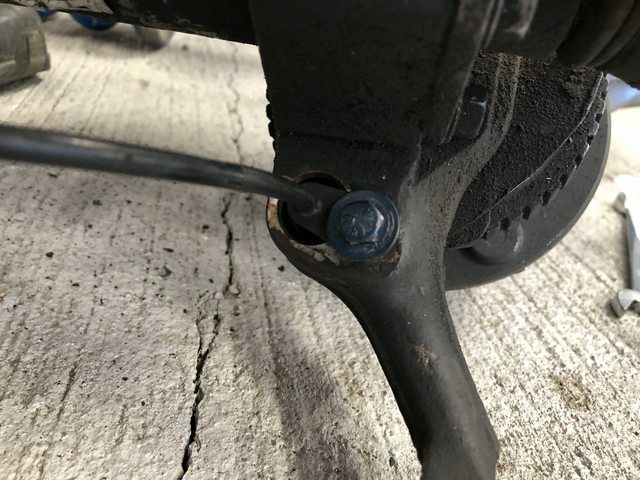 The rear BMW sensor has a long strain relief on the cable that needs to be carefully trimmed off, so that it can be tucked in under the parking brake drum. 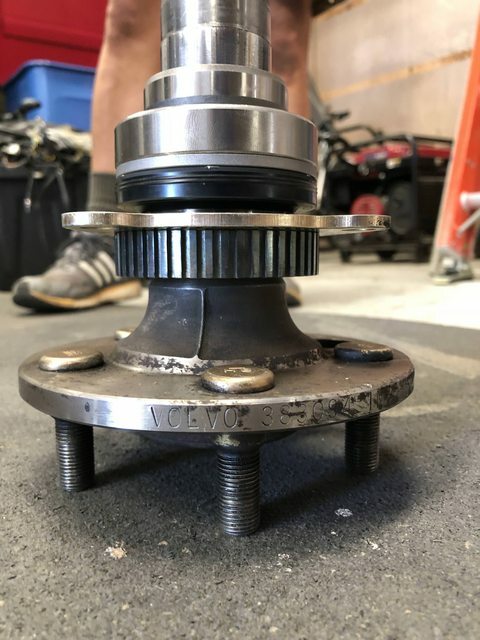 I can't say whether this would fit under the standard rear rotor, as we have S60 rotors on the car - you might need to shrink the ring or find another sensor to work with. Shown here with a 3d-printed prototype mount, the sensor mounts using existing holes from the handbrake mechanism and a bracket fabricated using 1.5" L stock. The front BMW sensor is a nice fit in the stock ABS knuckle, but it's not long enough. Here we copied the E30 guys and trimmed the sensor back. It looks terrible, but it works. 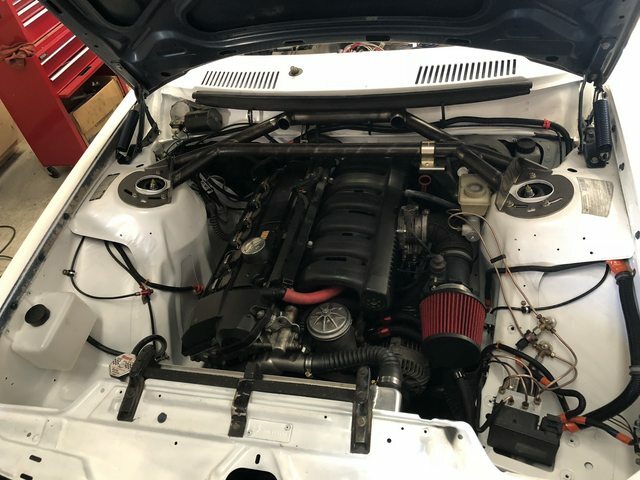 Engine compartment: ignore the M52, nothing to see here. The MK60 is normally mounted very close to the master cylinder in OE applications, but this is only required for DSC purposes. ABS-only installations work with it prettymuch anywhere. Wiring is very straightforward. You can wire the stock brake light wire into the ABS unit; the warning light is a bit trickier as the output from the ABS unit is pulled to ground to *disable* the warning light. 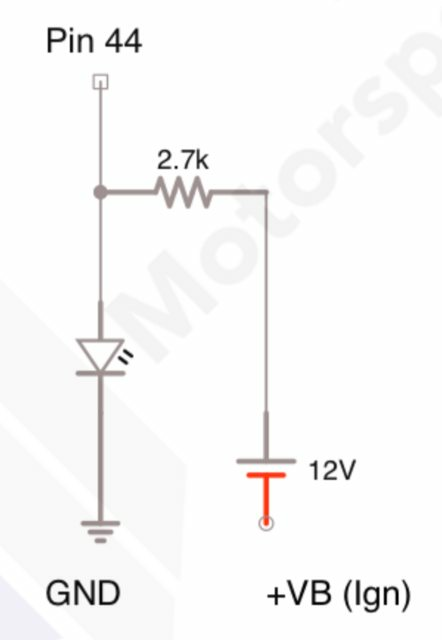 Either use an LED with a series resistor, or a relay. 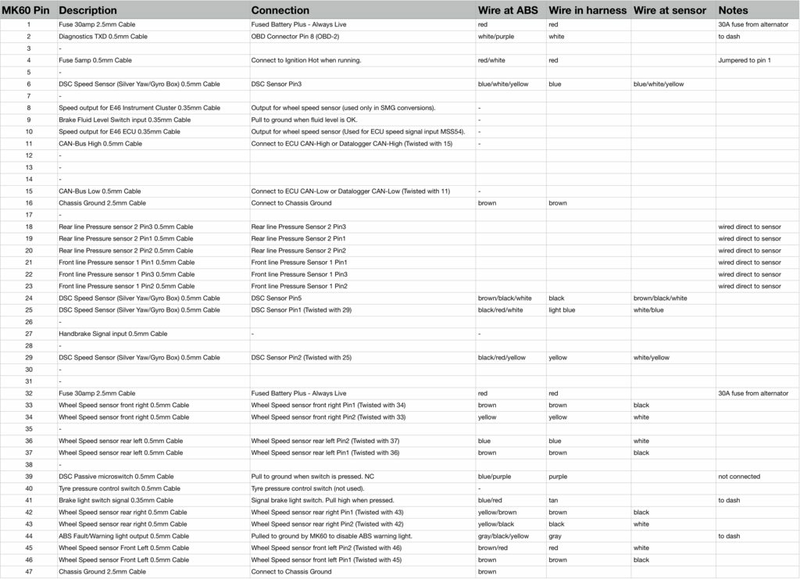 Image taken from a mostly helpful document produced by facebook.com/bmwm3motorsport. Note that in other applications the MK60 is driving a bulb directly; I tested one on the bench as drawing ~100mA, meaning that if you want to use a brighter LED, you can use a much lower-value resistor. We see good results with a super-bright BA9 LED and a 680R resistor. The DSC button input is not useful and can be left disconnected. 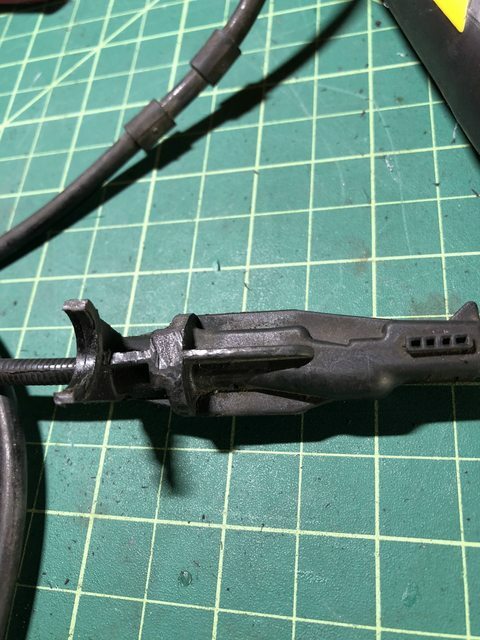 Make sure to tie the fluid level sensor input to ground (or wire up a fluid level sensor...). DSC sensor box is installed under the driver's seat in the correct orientation (connector forward, mounting surface up). The steering angle sensor is not required for ABS purposes, so we pitched it. Note that we don't have an ignition switch - you might choose to route pin #4 differently in a car that does. Last edited by DrZiplok; 09-25-2018 at 02:26 AM.. Reason: Added more details. One of my mates swapped E46 ABS into his E36 and it works great, didn't know the system was so standalone it could work in a completely different chassis without CAN. good to see you making progress on this! 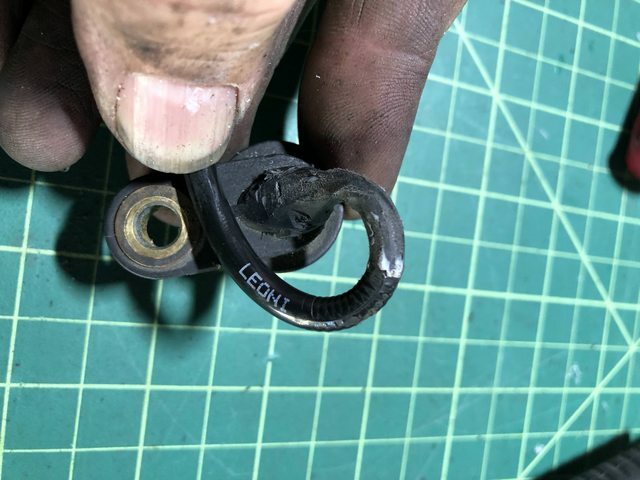 Is there a reason the stock 240 front ABS sensor would not work? Somewhere in the middle explanation about the magnetoresistive sensors. Considering the price of the signal converters its probably a better bet to gather the modern sensors. If doing the signal conversion, I wonder if the VR sensors found in the rare 740/760 traction control system could work, those are fitted close to the diff pumpkin. Sensors are still available new, usually $$. The stock sensor is a passive thing; essentially it's just a coil and you get a low-amplitude AC waveform out of it. The MK60 uses an 'active' sensor; there's a sensing element (Hall or reluctance) and then some signal processing and a current-mode driver. The driver alternates between sinking 7mA or 14mA to give you a nice square-wave output that's largely immune to electrical interference. Full disclosure, I'm a chassis controls engineer for Bosch, and I've got quite a few cool plans for mine. Easy part will be calibrating the system to operate how I'd like it for the Volvo (target slips optimized for the summer tires I put run, some vehicle rotation during trail-braking, etc). Where is will get fun is writing code for things like line-lock, hydraulic handbrake for drifting, Auto-LSD (brake torque vectoring), etc. 1) Did you consider the number of teeth on the new rear tone ring? Assuming the BMW had equal teeth front/rear, I bet you matched it to the front tone ring on the Volvo. 2) I'm having a hard time making out what you did to modify the front ABS sensor from the BMW. Do you have any other pictures? A before / after? 1) Rear tone rings are 48t, same as the front, same as the BMW application for the MK60. Updated the first post with some additional measurements & the tooth count. 2) The OE front sensor has a large brass boss molded into the plastic (so that Hans doesn't crush it when he's bolting it all together). 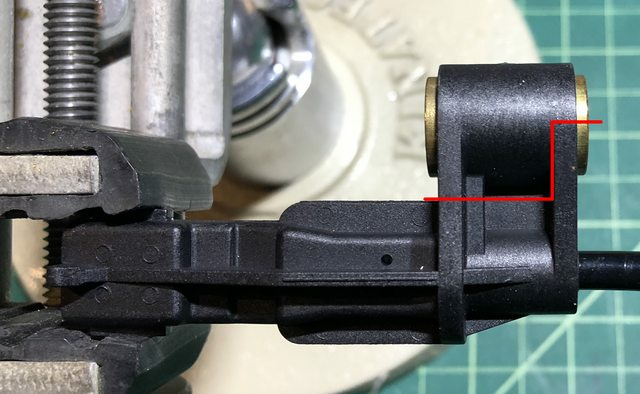 If you remove the boss and most of the plastic, you're left with an ear that locates the sensor at the right depth and which can be captured using a bolt in the stock sensor mounting location. Was that your K75 I saw in the shop at Abstatt a few years ago? Last edited by DrZiplok; 09-25-2018 at 02:27 AM..
Nope. I’ve only been to Abstatt on business trips a couple times. I’m based out of the Detroit area. Does that mean you have all the software to be able to tweak the settings on these things? Yes, I have the full software. I can update standard parameters (easy) and write new logic/code (more involved). It’s essentially what I do at work everyday. I expect that he will say that he works for Bosch and that he's not allowed to share. So how did it work last weekend? I was right behind you in the black 745 at tech. G'day! How did your frakentransmission work out? Best way to describe the MK60 setup would be that "it just works" (once we got everything bled properly), and night and day better than the old system. 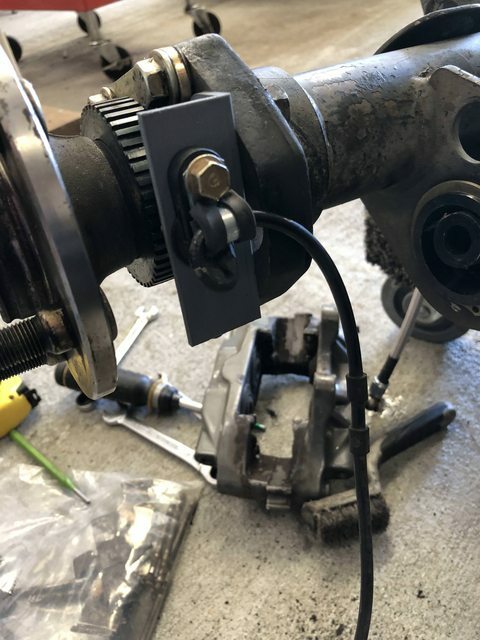 Probably the biggest single improvement was how much better it worked when the car was not going straight, but with the R brakes we would have been in a world of lockup hurt without it (since they're super bitey compared to our old setup). My transmission worked amazing compared to the M46 I had before. My brakes were awful, rears were locking up. I am evaluating what to do next with brakes. ABS would be nice, but I think the first step is getting rid of that wacky dual lines to the front brakes and putting in something where I can adjust the front and rear bias. Your car looked great and really fast. I don't know the 240 braking system, but did you use the stock master cylinders and is there a booster? Since we're using the larger S60R calipers, we upgraded to an SN95 Mustang master, still on the stock booster. If we'd stayed with the stock calipers, the stock ABS master would have been fine. You might want to see if you can hunt down Matt Wirth from Too Stupid to Know Better (the red-and-white 740 wagon). He has that car dialed right in and always seems to be happy to talk. This is great, did you have to reprogram the abs unit to work well in the Volvo? No re-coding was required to make it work. We did use the usual BMW Tools (INPA in particular) to bleed the unit; I suspect a lot of the cheap Chinese scantools will do it as well.